For any child, such as myself, who was raised in one of those rural areas where the brilliance of the stars in the sky were rivaled only by the stunning fireflies that flitted all about, this is the book for you. And if you are a city dweller and have not had the opportunity to see these charming little critters make the summer nights even more magical, this is definitely something your child would absolutely love to read and learn about. In this sweet tale, Daddy and his little girl (and the little dog, too), see the summer nights as taking a journey into a world of wonder and imagination. The moon rises high in the sky, the stars beam to add their light, and Daddy calls it a “firefly night.” Going on a journey with her glass jar in hand, we race with the young girl and her pup as she zips over the grass and collects fireflies so that she can, quite literally, hold stars in her hand. When the collecting is done and the fun has been had, the girl opens the lid and watches those lovely creatures unfurl their wings and soar over the land. The artwork in this book is truly lovely. From the excitement on the little girl’s face, to capturing that look of pure love and faith that a little girl and her father share, the artist has done a superior job of bringing these characters to light. In addition, this cover is one that will have the kids pulling this book off the shelf every night in order to see the glitter and glow of the fireflies. This is the perfect book for a child. You can even envision in your own mind that truly loving family sitting together with the beloved dog, the windows open so that the warm night breeze comes through, reading this great story. In addition, the author has placed information in the back of the book so that kids can learn all about those fireflies. The story involves a great way to first teach children how to count, and the book even offers arts and crafts ideas that kids would love to do. Every decade has one. We all know this. Whether it be our favorites from our time that we still remember…Curious George, perhaps? A little bear called Pooh and his magical friends? 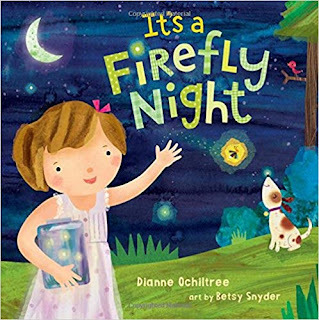 Or, even that special Goodnight Moon that has kept children entertained over many, many decades, It’s a Firefly Night has the same beauty, kindness, and special “something” to be that book for this generation and many more to come. Quill says: This is so well-written and fantastically illustrated that you’ll wish everynight was a Firefly Night!